On August 15th of 1913, the project that Msgr. 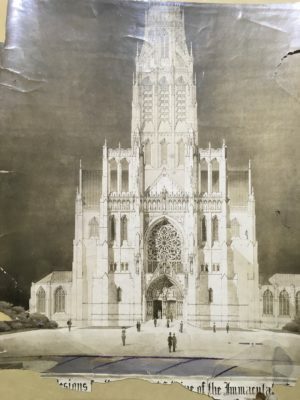 Thomas Shahan has been working on and dreaming of since the early 1900s was given the green light by none other than Pope Pius X. The approval was for the building of the Basilica of the National Shrine of the Immaculate Conception and the pope personally donated $400 to its construction ($10,000 in today’s money). The site of the national shrine was to be on the campus of The Catholic University of America in Washington D.C., which Msgr. Shahan was the rector of at the time. Shahan’s desire for the building of the shrine stemmed from the large Marian devotion during the 20th century as well as from a desire in raising the prestige of the Catholic Church in America. Indeed, Shahan stated that “every nation has some great National Monument in honor of our Blessed Mother,” revealing his belief that the United States needed to join the rest of Christendom in honoring Mary. Early plans for the shrine were more in line with a 14th century French Gothic Cathedral; however, eventually Shahan and the Building Committee, which Cardinal Dougherty served as the chairman, choose an architectural firm that proposed the merging of Byzantine and Romanesque styles. The change in design had a number of reasons, which the architect, Charles Maginnis, stated arose out of a desire for a “distinctively American” church that would allow for a blending of the architecture in Washington D.C. Another practical reason was the contemporary building of the Episcopal Cathedral in the Gothic style just across town. 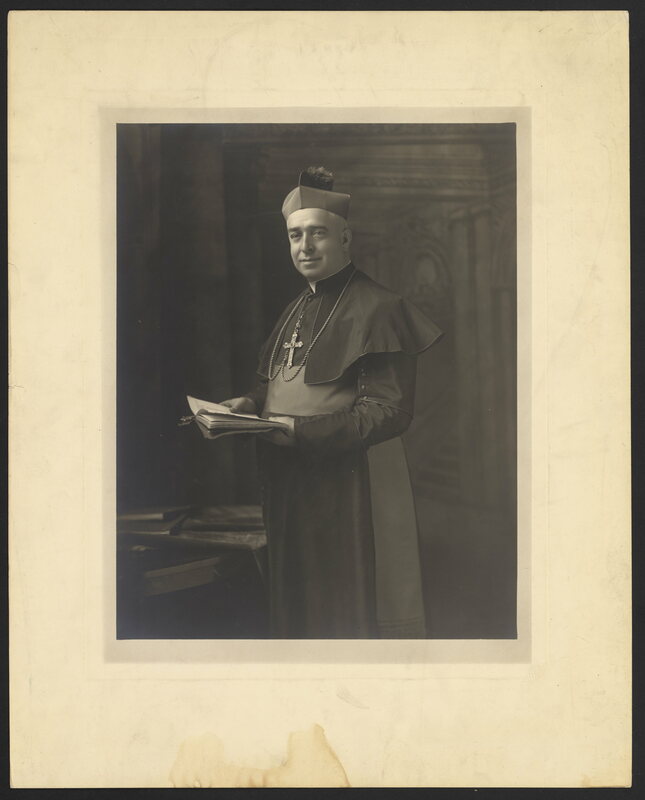 While mainly a story of the Church in Washington D.C., Philadelphia would have a number of important connections to the building of the shrine, including Reverend Bernard McKenna, who acted as Shahan’s secretary from 1915-1929 and then as the first director of the shrine from 1929-1933. 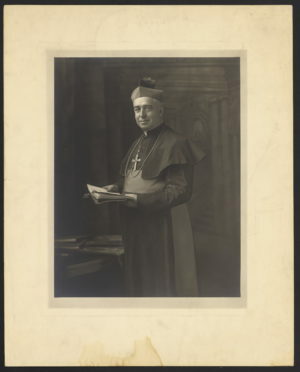 McKenna was born in Philadelphia in 1876 and was ordained in 1903. He would pay a large part in organizing the fundraising for the construction, which began with the publication of Salve Regina in 1914. By 1920 over $160,000 had been collected to fund the shrine, with contributions increasing over the decade so that by 1933 over $3 million had been raised. One interesting aspect of the fundraisers was that much of the effort was marketed and geared to women, with Shahan and McKenna working with the National Organization of Catholic Women and other such groups to raise funds. Finally on September 23, 1920, seven years after papal approval, the cornerstone was laid down and blessed before a crowd of 10,000. The ceremony was presided by Cardinal James Gibbons of Baltimore, with representatives from the United States government, including Justice Joseph McKenna, and 23 other nations in attendance. 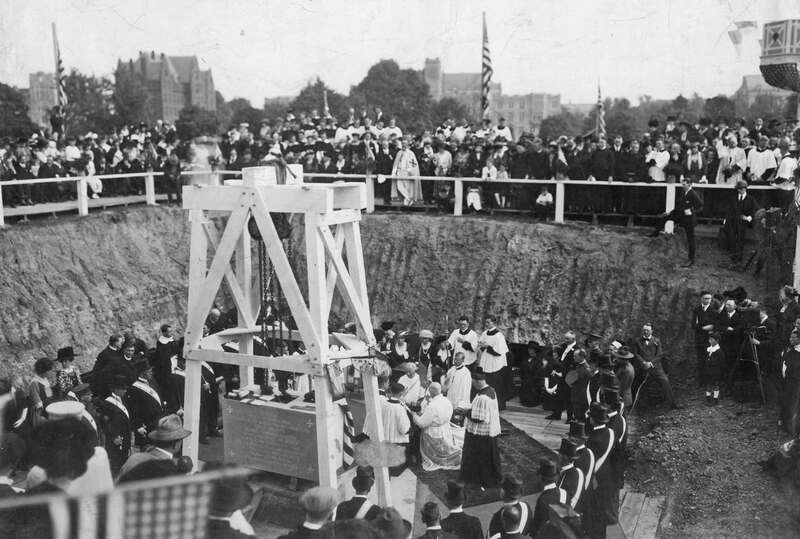 The cornerstone, weighing 4-tons, was donated by James Sexton of Connecticut, with 100 small pieces given out as souvenirs to dignitaries. Despite the cornerstone being laid in 1920, actual construction did not begin for another 2 years. Construction of the Crypt Church began in earnest in September of 1922 so that by 1924 the first Mass was able to be celebrated on Easter. The building continued along through the 1920s until 1931 when the crypt level was completed; however, because of the Great Depression, funding dried up so work the upper level was halted. Due to the delay, Shahan would to be unable to see the end of the project as he passed way in 1932. However, because of his role in the building of the Basilica, Shahan was buried in the shrine, the only person to receive the honor. It would not be until after World War II that plans to finish the shire were developed. A general appeal by all the U.S. bishops went out in 1953, raising over $8 million, which allowed construction to resume in 1954. Maginnis resumed the role of architect and began where he left off 20 years prior. Building continued through the rest of the 1950s, with the official dedication held on November 20th, 1959. 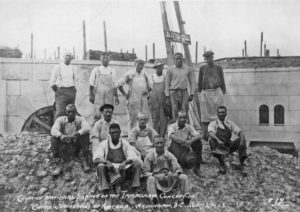 The building of the Basilica of the National Shrine of the Immaculate Conception has been a long project, which continues even to today. Despite this, the Basilica has become a center of Catholic worship and has given the country a shrine that rivals others from around the world. For more on the Basilica visit our online catalog and our archives for material on the dedication or copies of Salve Regina. “Overview of Shrine History, Significance and Current Status,” Basilica of the National Shrine of the Immaculate Conception, 1, http://www.nationalshrine.com/atf/cf/%7BB0534716-4524-407D-A065-B68C4BFCB4BE%7D/BASILICA%20BACKGROUNDER%20-%20as%20of%206-09.pdf; “CPI Inflation Calculator,” Bureau of Labor Statistics, https://data.bls.gov/cgi-bin/cpicalc.pl?cost1=400.00&year1=191301&year2=201709. Thomas Tweed, America's Church: The National Shrine and Catholic Presence in the Nation's Capital, (Oxford: Oxford University Press, 2011), 45. “Architecture,” Basilica of the National Shrine of the Immaculate Conception, http://www.nationalshrine.com/site/c.osJRKVPBJnH/b.4764147/k.9FF6/Architecture.htm. “The Bernard Aloysius McKenna Papers,” CU: Archives Mss. and Museum Coll. https://catalog.wrlc.org/cgi-bin/Pwebrecon.cgi?BBID=6958159. “Historical Timeline,” Basilica of the National Shrine of the Immaculate Conception, http://www.nationalshrine.com/site/c.osJRKVPBJnH/b.4784521/k.E4CB/Historical_Timeline.htm. Geraldine Rohling, “The Dedication of the Cornerstone,” Basilica of the National Shrine of the Immaculate Conception, http://www.kintera.org/site/pp.asp?c=etITK6OTG&b=1438217. “Overview of Shrine History,” 1. 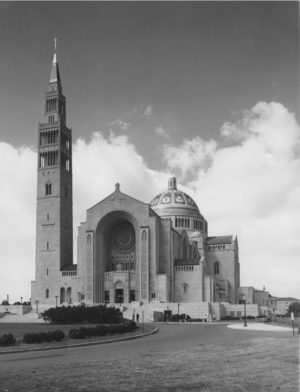 “Historic Highlights,” Basilica of the National Shrine of the Immaculate Conception, http://www.nationalshrine.com/site/c.osJRKVPBJnH/b.4764143/k.F4E0/Historic_Highlights.htm. Nancy Frazier O'Brien, "Bishops back national collection in 2017 to complete shrine mosaics," Catholic News Service, http://www.catholicnews.com/services/englishnews/2015/bishops-back-national-collection-in-2017-to-complete-shrine-mosaics.cfm. “Overview of Shrine History, Significance and Current Status," 1.